Summer time means kids wanting spend as much time as possible in pools and water sport. That is the good part. The bad part is that there are chlorine fumes to contend with, delicate skin to protect, skin and other infections to prevent. Here are some tips to keep kids safe and healthy when swimming this summer. 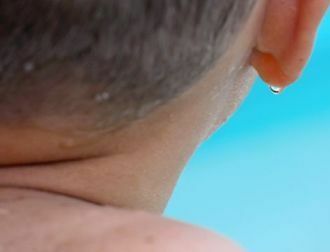 With all the swimming underwater and jumping and diving and flipping that kids do in the pool getting water in the ear is a common occurrence. This is not necessarily a bad thing but when it is contaminated water that gets into the ears, this could be a cause for problems. Firstly, make sure that water doesn’t settle in the ear canal of the child. If the child reports a blocked ear because of water getting in, get them to tilt their head towards the side of the affected ear and jump until they feel the water trickling out. Ask the doctor for any eardrops that may be necessary if your child is susceptible. Consider using earplugs to prevent water getting into the child’s ears. Recently there was a report of chlorine fumes sending kids and their swim coach to hospital. It was a mixture of muriatic acid and chlorine that resulted in the unfortunate incident. These chemical are added to kill germs and balance the acid levels of the pool water but an imbalance in these levels could be problematic for kids’ health. Make sure that the chemicals added to pools at home and elsewhere are the right balance. If there are any disturbing symptoms such as burning or irritation in the eyes, vomiting , coughing or respiratory irritation, this should be checked out by a doctor as a precautionary measure. Statistics show that death from drowning in pools is the leading cause of death and injuries among kids. The most important thing is constant supervision of a child in a swimming pool. Drowning occurs quickly and silently, so you need to be really careful. Also make kids aware of simple precautions such as never diving into the shallow end of the pool and so on. Visit the official pool safety website to find out more about pool safety. You can find out more about hazards that could be present in pools and spas and get specific pointers about remaining safe in home pools as well as community pools.